We have two children. We used to have three. Our third child didn’t grow up and leave home, she didn’t die. We relinquished her. Aren’t adoption stories supposed to have happy endings? While there are many adoption stories that do have happy endings, this is not one of them. And we’ve come to learn we are not alone. More and more families are finding themselves in situations similar to ours, feeling like there is no way out. This book is my story of adopting a child who was unable to attach. It is a chronicle of investment and sacrifice in our daughter, the pain and loss we experienced, the grief of darkened hopes and loss of a dream. It is also a story of grace and healing, of relinquishment and new beginnings. This was such a hard book to read as a mom. My heart just ached for Kristen and her family, and even for Emma. As I read through this book, I had to remind myself over and over again how old Emma was. I had to go back early on in the story to look up her age, because I thought she was behaving like a 5-6 yr old who wasn't getting their way. To be reminded at the time she was under 2 yrs old, blew me away. Reading through this book, we aren't really on an emotional roller coaster, it's more like a plane in an uncontrolled spin. You hope beyond hope that a switch will be flipped and Emma will "get it". That she'll realize that if she allows it, these people in her new family will love her to the ends of the earth. As Kristen and her husband, Andrew, forge through the fire, we learn along with them that Emma has neurological and attatchment disorders. Disrupting Grace is told from the heartbreak of a mom and she shares how Emma reacts to the biological children of Kristen and Andrew. Her manipulation and all out distruction of this family is so hard to read about. You know that this little girl's life has been forever impacted by her beginning years in Thailand and that her sole goal is survival. She doesn't understand that she is being given the world on a gold platter. All Emma knows is she will do whatever it takes to ensure her survival. 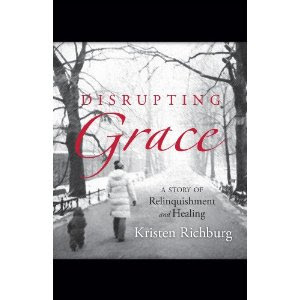 Kristen's honesty and devotion to her entire family is set before you in Disrupting Grace. The Lord is constantly a part of this story and He is their rock. This short, but powerful book is one that should be on every bookshelf. Kristen Richburg has a B.A in Social Work, is a stay at home mom, and lives in Boulder County, CO with her husband and two children. I finished this book last weekend - I agree that it was very hard to read as a mother. I just couldn't imagine what Emma went through before the adoption to cause the problems that she had. Good review. Great review!I'll have to look into this one. It sounds sad but hopeful at the same time. BTW just found your blog and I love it :) I'm following you. i have to read,sounds interesting. Thanks.